e-Rocks has a mineral database of over 5,500 stored mineral species (plus other defined associated non-mineral items), we provide daily updates from a pool of over 120 Sellers, often adding over 200 new listings per day. As well as having to deal with a large volume of new listings each day, e-Rocks has also developed into a platform offering more rare or systematic minerals for these interests. Although we encourage you to browse everything, it has become more difficult to find things of interest quickly and efficiently. We have developed our search engine and already created personalised views within your account with My Items, and added Saved Searches to let you bookmark and access your searches for mineral and/or locality (Seller and so on); this will and also contact you when a new item matching your search is added. Now we have now added our My List app to these tools. My List is a feature exclusive to e-Rocks that allows you to use our mineral database to set up and manage your own list of a mineral species of interest. *currently unrestricted in Beta programme. The premium version of My List is available to all Collector account customers within the bundle of additional features offered. Please see the Collector Account subscription page for details. More details of the additional My List features are given below. The My List feature is available to all registered users and is accessed via the My List Tab in the logged in User menu. 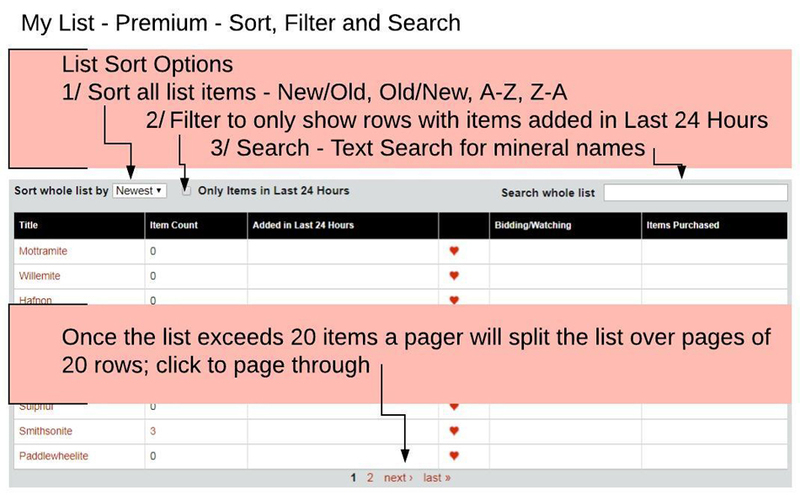 When in use My List is basically a table of your selected minerals with rows containing dynamic bookmarks for the mineral. The table will allow you to look out for or watch specific minerals of interest on e-Rocks - seeing everything at a glance. 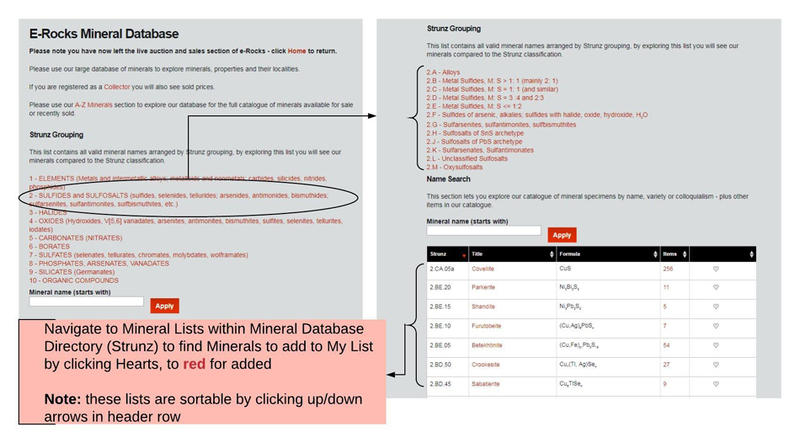 In order to use the My List feature first you need to be logged in and begin adding mineral species of interest to the list. This can be done via our webpages or directly into the My List page. 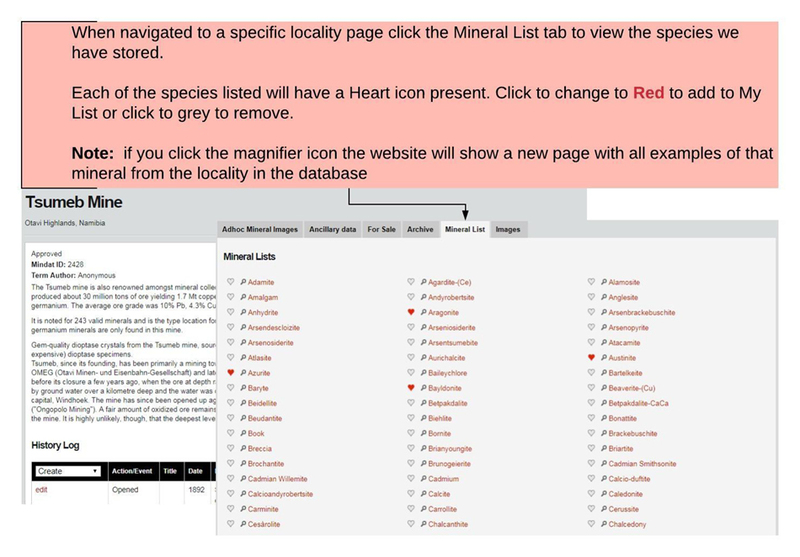 In the appropriate mineral species page we have a simple on/off clickable Heart icon. If you want to add or subtract a mineral in any of these places just click and change the colour state of the Heart icon, the Heart will show in all instances, it will be grey for “off” – not on list, and red for “on” added to list. If you want to add or subtract a mineral in any of these places just click and change the colour state of the Heart, this will automatically update across all views and add/remove from My List. On the My List page you will see a table containing the mineral species in your list. You can remove any minerals by clicking the red heart symbol so it reverts to grey. The mineral will stay on your list in grey format until the page is refreshed, so you can undo by clicking again to restore the red. If you want to add a mineral in the My List Page, start typing the mineral name into the search box and then select the required option from the dropdown. You are able to use the input box (or click hearts on other pages) to build your list up to a list count of 10. Once you reach 10 minerals the list will update and the input box will be hidden, until you remove a mineral to make way for another. If you add more minerals than allowed (via the input box) you will receive a warning that the limit has been reached and that not all the minerals will be shown. The premium My List option will not display these restrictions. Access to the bulk upload feature is done by clicking the Bulk Upload option. When clicked an input panel will appear in a pop up. 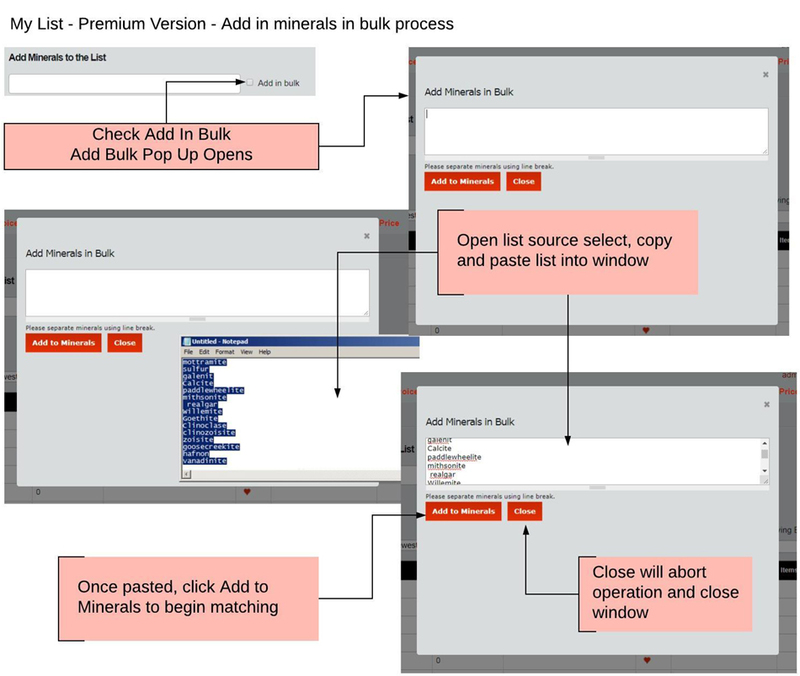 When present cut and paste your mineral list into the box and click "Add to Minerals"
The list will be matched and processed. First all matched minerals will be listed with red hearts - these will be saved to your My List at the end of the process. Unmatched minerals will be presented in an Edit panel. There is a choice of 2 actions. 1/ Amend any typos or mispelling to match approved mineral name, eg Galenite to Galena or Flourite to Fluorite. 2/ If you are certain spelling is correct and a new mineral name is needed (eg it is a new mineral) check the add new mineral option. See note. Once edited, click continue and the website will match again, and process correctly matched minerals and/or post new mineral type to the database. If there are still non matches, the Edit panel will reappear until you either fix or delete the unmatched rows. Once everything is matched the process will complete and matched minerals will be placed on your My List. Note: With the Match Edit panel there is a Cancel button. Clicking this will cease the process and allow you to start again, matched items will be discarded. Minerals [Name] added to the database. Once you have added some minerals to My List you can begin using the bookmark links to check in on items on the database. One of the bookmarks is to show items containing the mineral added in the last 24 hours. We have also provided an email notification that will send you a combined email listing the minerals added in the last 24 hours and that are on your list. The email is programmed to send daily at 21:00 GMT and usually arrives a few minutes after. The email notifier is controlled by a toggle switch in My Items (and also in My Profile/Email settings), it has to be set to On - Red to work. The switch also can also be deactivated from the email. Switching on/off can be done at any time, and as often as desired. 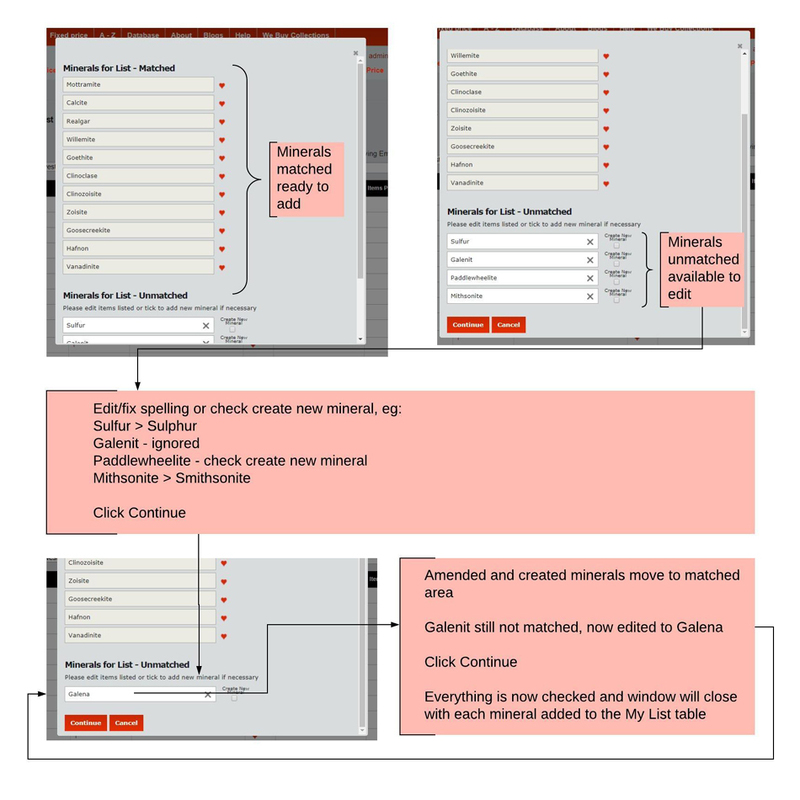 In order to organise the list and its content we have provided some onscreen tools to manipulate your minerals. The different versions have different tools. Set into the header rows of the the list are Up and Down arrows for ordering the data, based on ascending or descending values. It is expected that as a Collector account user you will want to add a much larger number of minerals into My List. In order to facilitate finding minerals there are a set of controls to help. These are set out below. If you want to wipe all items from your list and start again, this can be done by clicking the Remove All link, then confirming via the Ok button in the following pop up. 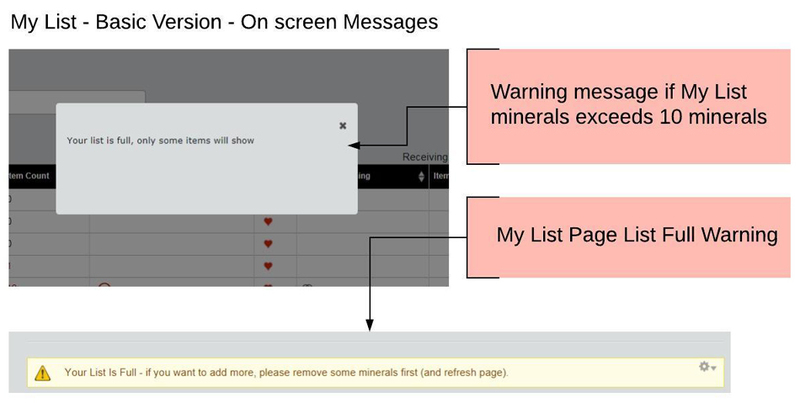 Note this will remove all minerals in the list, it will not clear your user data, such as Watches etc. You are able to reapply any of the minerals removed and the data will return to view. We hope you enjoy the My List App and find it useful. If you have any questions or suggestions please do not hesitate to ask.